The first 10 minutes of my walk is a concrete nightmare. Emerging out of  Bromley on Bow Station, I have to contend with the A12 flyover, a dark subway and a Tesco carpark. 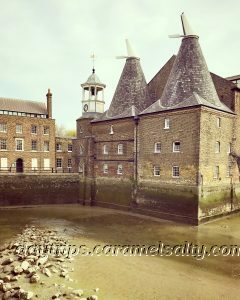 Thankfully it all changes when I cross over the cobble stone bridge to  Three Mills, site of the world’s largest tidal mills. Aaaah!! Some Nature At Last!! The mills were originally owned by Stratford Longthorne Abbey which Henry VIII demolishes in 1538. The 1086 Domesday census registers up to 8 mills here. But the mills I can see are much newer. The very striking  Clock Mill is built in 1817. 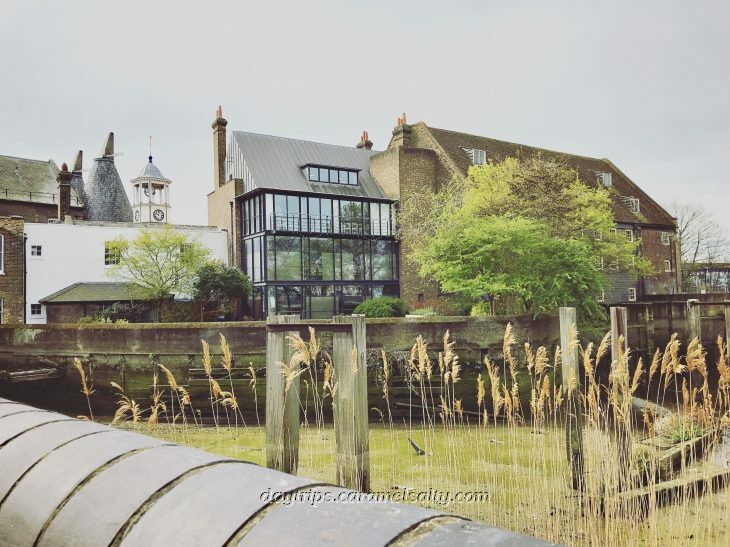 The atmospheric Grade I listed  House Mill Museum is built in 1770 by a Huguenot refugee. 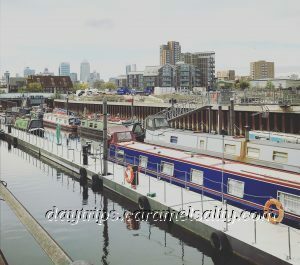 Three Mills is an island surrounded by 3 channels of the River Lea. Low tide is the best time to appreciate the speed of the tide coming in. It may look muddy and shallow now, but the water mark on the buildings suggest that it gets as high as 6 feet. Which is why there’s a sign warning people not to jump in!! 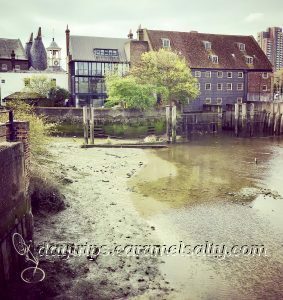 In the 16th century, the mills were milling flour for the famous bakers of Stratford-atte-Bow. In the 18th century, distilleries were being built to meet the demand of London’s gin craze. Today, some of these distilleries have been converted to the 10 acre  Three Mills (TV) Studios. One can only visit the TV studios if one works here or has applied to be part of a studio TV audience. But there is a slice of TV history in the open green area next to the studios. This is  Three Mills Green, where the set of the reality show Big Brother was located. I proceed across  Three Mills Lock on  Prescott Channel. The locks are made of steel. 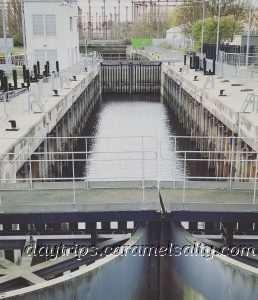 They look cold and unyielding, in contrast to the old wooden locks everywhere else. But at least they are now in working order, thanks to the regeneration of this area for the 2012 London Olympics. 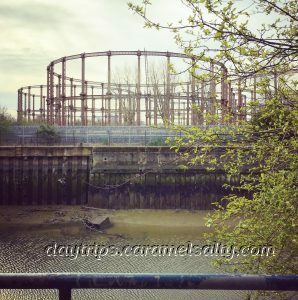 The gas works across  Channelsea River is a reminder of this area’s industrial past. 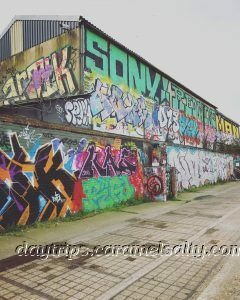 Tarmac, rail and high voltage cabling ran across this land dotted with factories, industrial units and salvage yards. 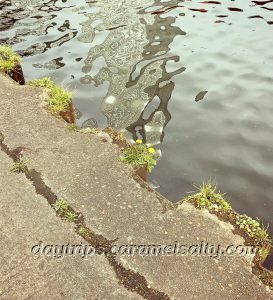 Pollution spewed into the River Lea. I hope to goodness they did not let children play here! 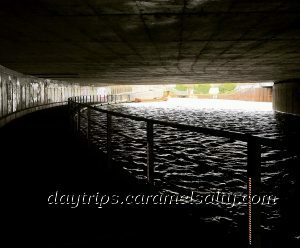 The other thing being channeled out to Three Mills is London’s sewage. In Victorian times, London is so highly populated and sewerless, that everything is flushed into the Thames. 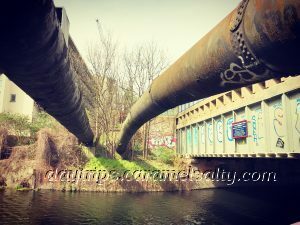 And so massive great big pipes are built to drain this waste away from London. 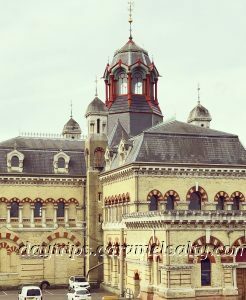 In 1868, the engineer Bazelgette and the architect Charles Driver build  Abbey Mills Pumping Station to pump this waste through the sewers. For a sewage station, it’s very elaborate. It resembles an orthodox church. The inside is so stupendous, that it’s called the cathedral of sewage. Abbey Mills is named so because it is built on the site of one of the mills of Longthorne Abbey. 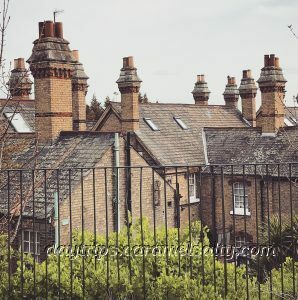 And there are other Victorian marvels around in the shape of the chimneys of the houses across from the pumping mill. Throughout my walk around Three Mills, the red steel  AcerlorMittal Orbit is visible in the northern skyline as reminder of how close the 2012 Olympic Stadium is. As I circle back round to return to the entrance of Three Mills, I spy  Canary Wharf, due south, on the  Isle of Dogs. It’s a construction site all around me. Riverside living is all the rage and so the regeneration from the 2012 London Olympics continues. Judging by the number of cranes and scaffolding covered blocks, it is certainly vying to to be the most densely populated part of London. Here is how it’s going to look one day. Plenty of High Rise Flats Around !! 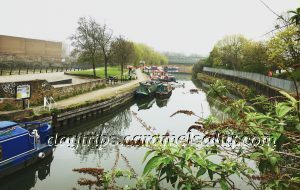 I exit Three Mills island for my walk along the  River Lea. 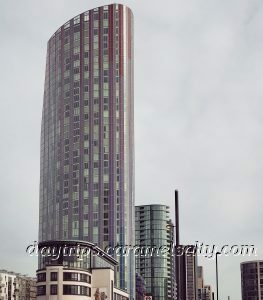 A man stands on his balcony, looking across to the flats that will soon overlook his flat. 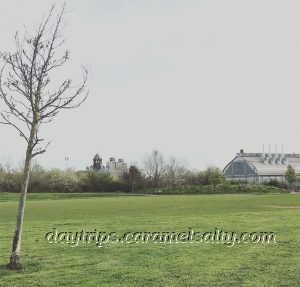 Regeneration is a good use of industrial land that’s become tipping grounds for unwanted fridges, household rubbish and the supermarket trolleys that transport them there. But will the large influx of people destroy the river’s fragile environment ? As London’s East End was outside the city boundaries, it wasn’t closely regulated during the industrial revolution. Factory waste poured into the Lea, poisoning the water and killing wildlife. 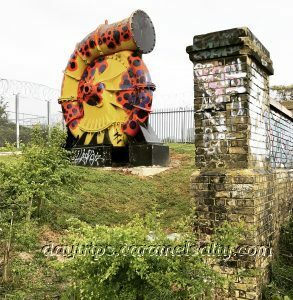 It is only as recently as 2016 that a tunnel was opened in Abbey Mills to mobilize up to 16 million tonnes of sewage away from the River Lea to Beckton. Sorry Beckton!! 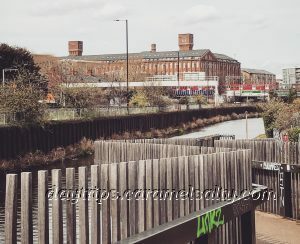 When I cross over to the path on the other side of the River Lea, I finally see the red brick building of  Bryant and May, the old match factory. White phosphorus was cheap. And toxic. The mainly female, including teenage workforce, suffer from rotting jaws, swelling of the gums and abscesses. Treatment is to remove the lower jaw. Otherwise the disease will spread and kill you. Painfully. Phossy Jaws is in the list of the top 10 deadliest occupational diseases. Which is why the ladies strike despite depriving themselves of their pitiful wages. The Salvation Army opens a factory nearby, using the safer but expensive red phosphorus. But they cannot compete in price. It’s only when the House of Commons bans white phosphorus in 1910, that red matches become the norm. As I walk along the river, I realize the place hasn’t quite shaken off its industrial past. I here the chugging of engines, the whine of machinery, a repetitive drill and the clatter of trains. The tip of a sand pile gives away the location of a quarry. And I also get to wander underneath two old black Victorian pipes. 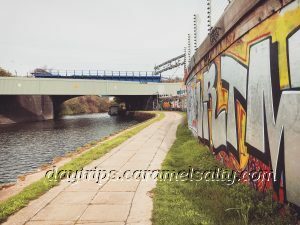 The scene is slowly morphing from one of motorways, industry and mills to an Olympic Park, office units and restaurants as I continue my walk towards the ancient river crossing of  Old Ford on the River Lea. I look forward to the continuation of my adventures along the River Lea. House Mill (website) – can only be visited by guided tours which run on Sundays, monthly in the winter. A small fee applies. Abbey House Pumping Mills can be visited during Open London in September each year. Pre booking is required. 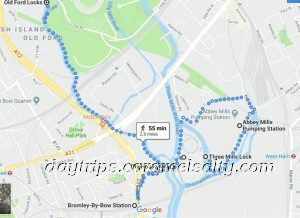 AA Walk Of Three Mills and Along The Canal –pdf guide here. 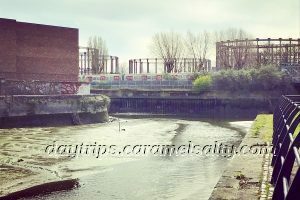 It doesn’t show the detour to Abbey Mills Pumping House.